I am going to say this as gently as possible; please accept it in the spirit that it is offered. Please do not thank a veteran this weekend. We have our day in November. This weekend is for our friends, our brothers and sisters who paid the ultimate sacrifice and gave their lives in the cause of freedom. When you thank us, as sincere as it is, it reminds us that we came home, while they did not. Somehow, for us, it lessens the solemnity of the day and heightens our survivor guilt. We appreciate your gratitude. We are embarrassed by it, but we appreciate it. But please, please, this weekend, remember it is not about service, it is about sacrifice. And while willing, we did not make that sacrifice. . . 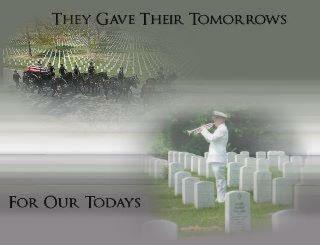 I am so proud of our servicemen who did not hesitate to give the ultimate sacrifice for us. Have a peaceful day. It's a hard day. Well said. Thank you - perfectly said.